When Portuguese explorer Ferdinand Magellan, working for the crown of Spain, arrived in Cebu in 1521, he was warmly received by the chieftain of Cebu, Rajah Humabon, his wife Queen Juana, and their subjects. Magellan then persuaded Humabon to form an alliance with Spain. Afterward Humabon, his wife and their subjects were baptized into the Roman Catholic faith. On April 14, 1521, Magellan planted a wooden cross on the shores of Cebu to commemorate the baptism of Humabon, his wife and their subjects, and to signify the establishment of Christianity in the Philippines. The cross that Magellan planted has been known since then as the Magellan’s Cross. Since 1834, the cross and has been housed inside a small chapel or kiosk that is shaped like a gazebo and made of adobe and red tiles. The kiosk is located beside the Basilica Minore del Santo Niño on Magallanes Street and in front of the city hall building of Cebu City. A plaque was placed just above the entrance of the kiosk in 1941. 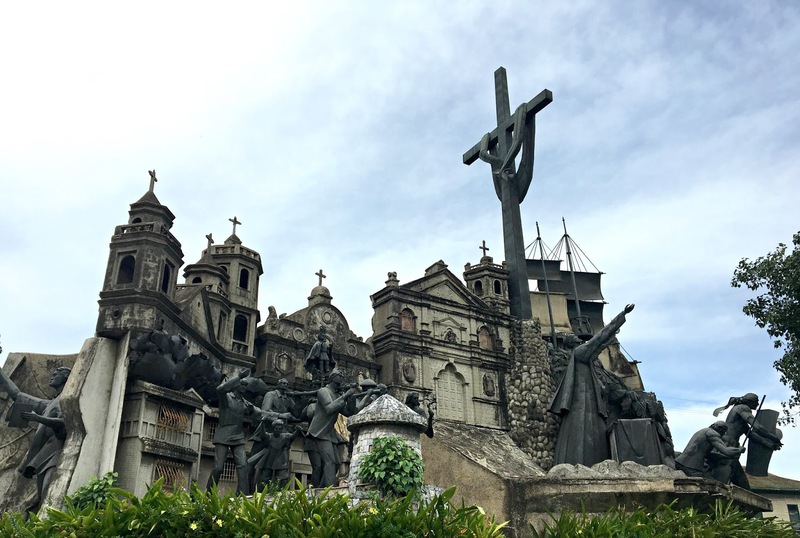 The plague says that “From time immemorial this spot has been set aside to commemorate the erection of a cross in Cebu by the Expedition of Magellan. When King Humabon of Cebu and his Queen, son, and daughters, together with some 800 of their subjects were baptized by Father Pedro Valderrama. This hallowed site was improved in 1735 by Rev. Juan Albarran, Prior of San Agustin and in 1834 by Rt. Rev. Santos Gomez Maranon Bishop of Cebu. A sign below the cross states that the original cross is encased inside a cross made of tindalo wood. That was done to protect the original Magellan’s Cross from people who chipped away parts of the cross in the belief that the cross has miraculous powers or for souvenir purposes. When you enter inside the kiosk, you will see the Magellan’s Cross situated in the center. 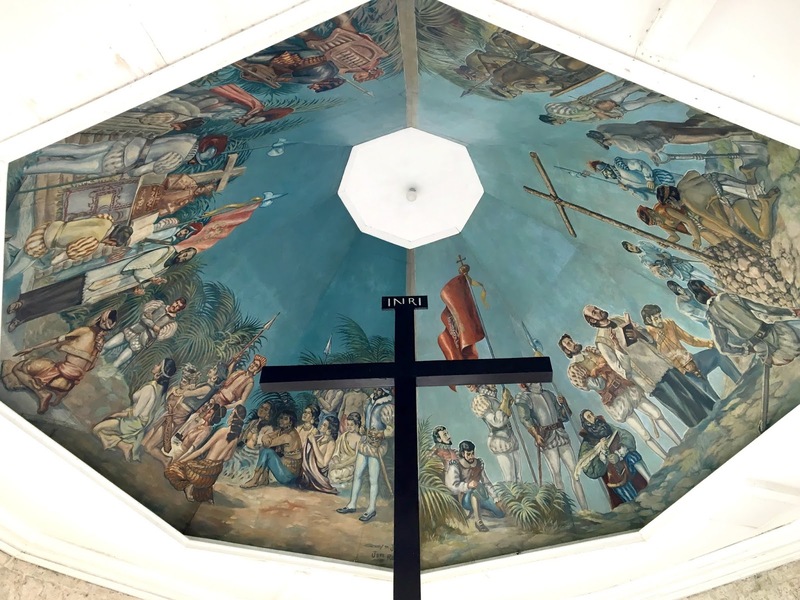 The ceiling above the cross has paintings that depict the arrival of Magellan and the planting of the cross, and the baptism of Rajah Humabon, his wife and their subjects. 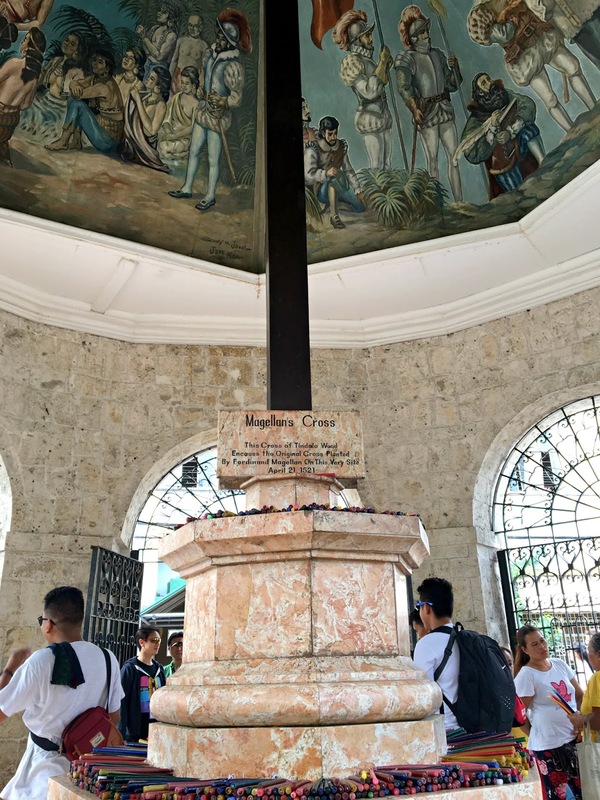 However, some historians and other people believe that the original cross had been destroyed or had disappeared after Magellan was killed and that the cross encased inside the tindalo wood cross is a replica that was planted there by the Spaniards who came after the death of Magellan. 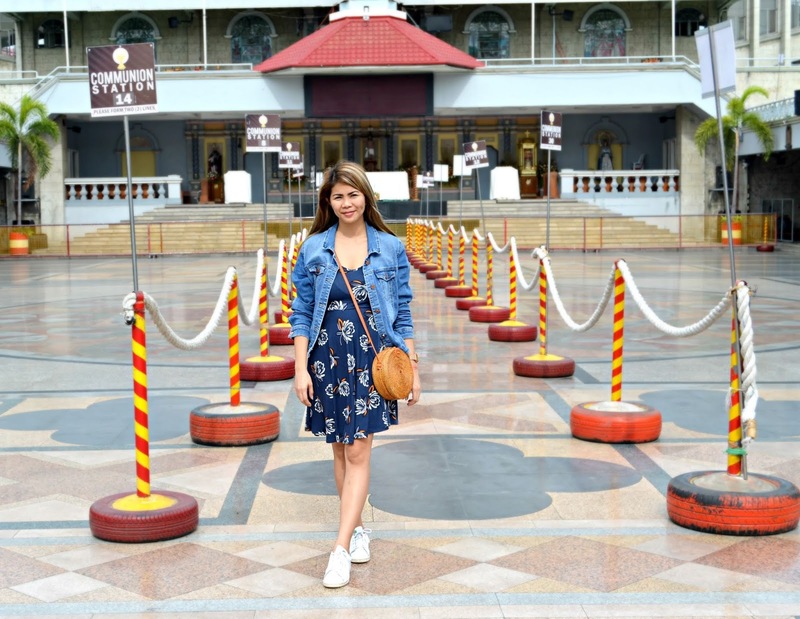 Today, the Magellan’s Cross is a popular tourist attraction in Cebu. It is also a symbol of Cebu City and the kiosk’s image can be found in its official city seal. In addition, many government and non-government organizations based in Cebu use the Magellan’s Cross or the kiosk in their seals and logos. The Magellan’s Cross is seen as the symbol of the establishment of Roman Catholicism in the Philippines. The Basilica Complex of Basilica Minore del Sto. 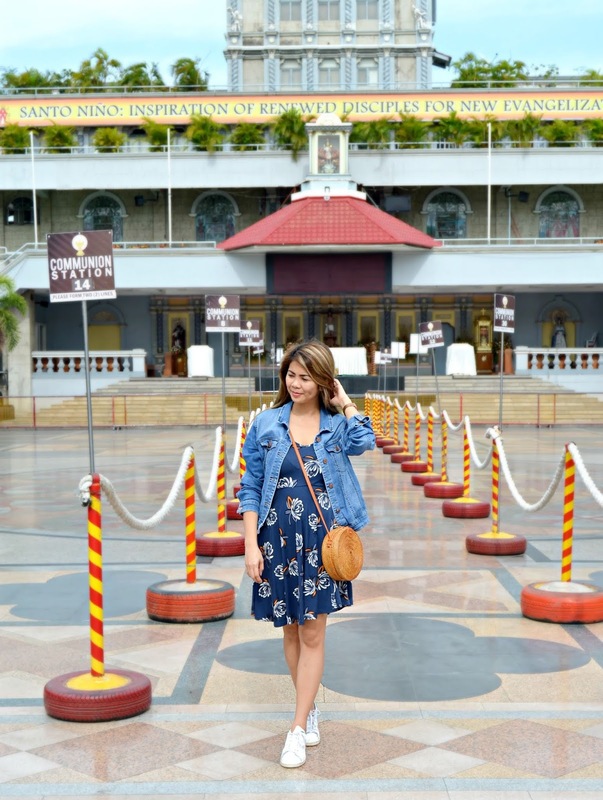 Nino is located in city block bordered by the Osmena Boulevard, D. Jakosalem Street, P. Burgos Street, and the Plaza Sugbo where the Magellan’s Cross is located. The main entrance is on Osmena Boulevard. Two blocks at the north of the basilica is the Cebu Metropolitan Cathedral. It is where the Roman Catholic Archdiocese of Cebu seats. 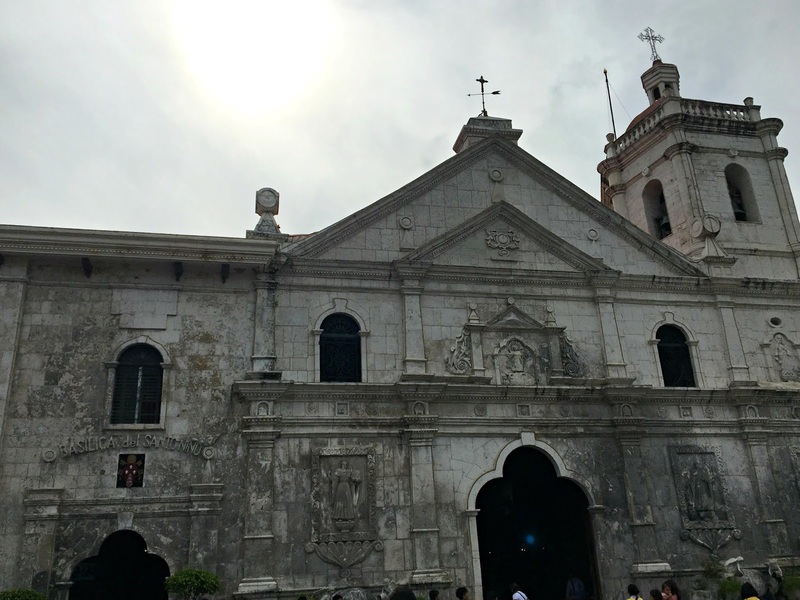 The architecture of the church is typical of Spanish colonial churches in the country, namely, squat and with thick walls to withstand typhoons and other natural calamities. The facade features a trefoil-shaped pediment, which is decorated with carved relieves of floral motifs, an IHS inscription and a pair of griffins. The Spanish Royal Coat of Arms is emblazoned in low relief above the main entrance, reflecting perhaps the contribution of the Spanish monarch to its construction. The Fort San Pedro (or the Fuerte de San Pedro in Spanish) is a military defense structure in Cebu. It was built by the Spaniards under the command of Miguel Lopez de Legazpi, the first governor of Captaincy General of the Philippines. The original fort built right after the arrival of Legaspi and his expedition was made of wood. It was then replaced in the 17th century with a stone fort to repel Muslim raiders. Today’s fort was built in 1738. It is the oldest triangular bastion fort in the country. 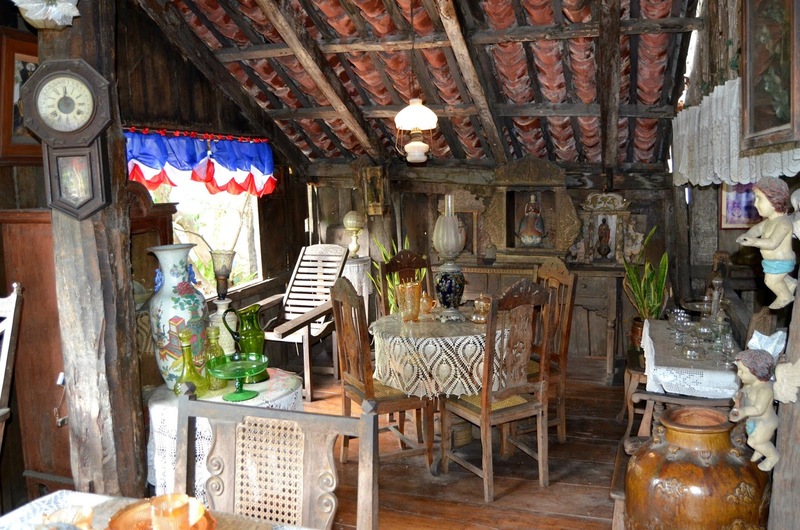 It served as the embryo of the very first Spanish settlement in the Philippines. At the end of the 19th century during the Philippine Revolution, the fort was attacked and taken by the Filipino Revolutionaries who used it as a stronghold.